we now have violated the rule of isolation by connecting 2 grounds from different worlds together??????? please add different suggestions to protect my new system that i am about to install from lightning???????? 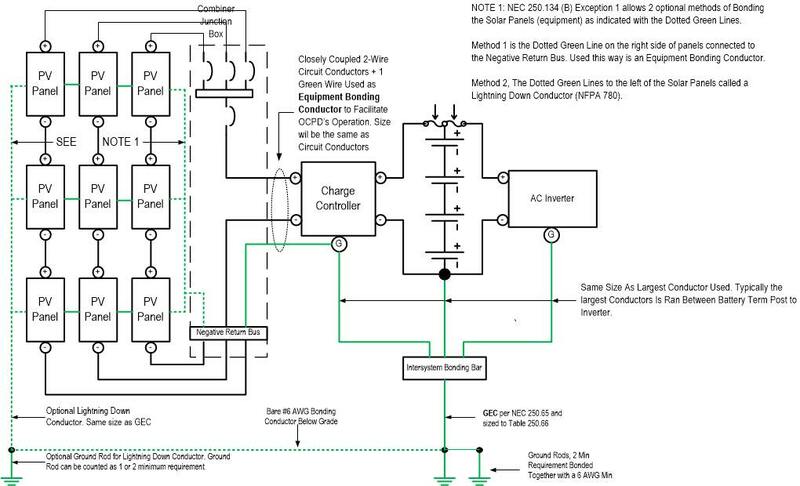 i wonder how this method protect from lightning the extra voltage will apear to the mppt controller and i cant see a way that it will get diverted to chassis ground??????? First thing to wrap your head around is Dirt Ground Does Absolutely Nothing under normal operation other than establish a 0-Volt reference point. You can use a Ham Sandwich as you Ground Connection and every works as planned. What is confusing you and just about everyone else is you do not understand what Ground means. The terminology is by design to confuse you. We did it to confuse communist and DIY. You think I am joking? We kind of but the irony is the truth of it. Define Ground, I dare you. We can go to the NEC, the authority for Structured wired systems like a house, and Ground is defined: THE EARTH. I am not kidding and as you can see means nothing. In NEC the word Ground is used improperly. In any NEC Code Compliant application there is technically only 1 Single Conductor that can be called Ground, and is called the Ground Electrode Conductor aka GEC. It is the only cable connected to THE EARTH. Any other conductor used as ground is a BONDING JUMPER or BONDING CONDUCTOR. Example if you open your Main Breaker Panel each Branch Circuit has 3-wires usually Black, White, and Green for Line, Neutral, and Ground respectively. The Green wire old name is Equipment Grounding Conductor aka EGC, today is called Equipment Bonding Conductor (EBC). So what is the purpose of the EBC? It has two purposes and two only. Nothing more, nothing less. 1. It references the Chassis to earth Potential. 2. Provides a Fault Path back to Neutral in the event the line Conductor comes in contact with the Chassis. The short circuit causes extremely high current which trips the Breaker or Fuse and clears the fault. No where is the kicker, no Earth Ground Required for the Breaker to function properly because no CURRENT ever is allowed to use EARTH as a conductor. It is forbidden to use Ground as a circuit conductor. Only utilities can use Earth as a conductor. So now let's answer your question. Code requires you to Bond all Raceways and any exposed conductive surfaces to be Bonded together and connected to Earth. This is just a Reference Point so if you touch the any raceway or equipment chassis there is no Potential Voltage standing on it waiting to bite you. It also provides the PLANNED PATH back to the SOURCE of Power which is NOT EARTH aka Ground. This has nothing to do with a Grounded System which relates directly to your question. You will not like this part. A Grounded System is a system where 1 Circuit Conductor is intentionally bonded to Earth. In an AC Wiring System the Grounded Circuit Conductor is called Neutral, in a DC Battery System can be either the Positive or Negative Term Post of the Battery, take your pick. So what does a Grounded System do for you? It makes Over Current Protection easy and cheap. On a Grounded System, to protect the circuit conductors only requires one Over Current Protection Device (OCPD, eg fuses and breakers) per circuit on the Un-Grounded Circuit Conductor aka Line or Hot. Otherwise on a Floating System, requires much more expensive OCPD's like Ground Fault Detectors and using OCPD's on both Circuit Conductors more than doubling the cost. On the downside a Grounded System is prone to unnecessary outages and makes it more dangerous to electrical shock potential because you referenced it to EARTH. Here is th epart you will not like. If your Inverter, Charge Controller, and gizmo bonds the Chassis to one of the Battery Conductors internally is NOT MADE to be used in a NEC application like a house or structure. It was made for Motive applications where the Frame, Chassis, and body Panels are used as CIRCUIT CONDUCTORS on Planes, Trains, Ships, Boats, Cars, RV's and Trucks they call GROUND which again has nothing to do with EARTH. Controllers and Inverters made for Premises Wiring Systems do not have the Chassis bonded to any Circuit Conductors because the NEC forbids Earth and Bonding Conductor to be used as circuit conductors carrying normal operating current. NEC is Stupid Simple when it comes to Grounding and Bonding and can be summed up in one sentence. Bond everything together with Jumpers below dirt together and call it a Ground Electrode, bond every thing everything above dirt together with Bonding Jumpers, then Bond both together at 1 Single Point and 1 single point only together with the GEC your only connection to EARTH. Last edited by Sunking; 11-05-2018, 05:10 PM. can you refute this? i dont think you can ....or like put it ......dare you! Q. What is SMPS ?? I just cannot figure out what you are trying to do. For electrical "grid" or off-grid power shock protection, you have one ground connection in the electrical entrance/service panel. if Lightning does hit your system/house, assume all electrical gear will be destroyed, panels, inverters.... everything, but the main energy of the strike will not enter your house and light it on fire. Make a mistake, and you are burned up. All good controllers are a form of Switch Mode Power Supplies, and yes Input can be isolated from Output, or NOT But you are wrong the controller will blow anything. Fact is if used in a Code Compliant manner, there cannot be any ISOLATED ground. All systems must use a common ground. Manufactures know this fact so they can comply with NEC 250.50 and 250.58 electrical codes. Why don't you?. So yeah I can refute that all day long. It is no different than an Isolation Transformer. The Isolation is for Differential Modes, not Common Mode faults. Lightning is a Common Mode fault. Mike you understand the concept corrrectly. NEC allows a user to Bond the panels frames by two optional methods. You must use one of them. One by using the Ground as a Equipment Bonding Jumper or green wire ran with the circuit conductors (the positive and negative power wires from the panels) Think of it like your great big Santa Sleigh and Reindeer xmas decoration on your roof built on a wire frame with a 3-wire power cord you plug into a outside outlet to light it up and power the motor. The green wire ground is bonded to the wire frame so if the Line Side insulation were to wear through in the wind and make accidental contact, with the frame, provides planned fault path back Grounded Circuit Conductor in your main panel and operates the breaker clearing the fault. Now if Santa were struck by lightning you are screwed. Lightning is looking for DIRT, and to get there it sees DIRT (green wire) and travels on the Green Wire back to your Service Panel right through your house wiring system to find Dirt through the Ground Electrode Conductor bonded to the Grounded Circuit Conductor coming from the Utility. NEC does not address nor require any type of Lightning Protection System (LPS). That is on you. It only provides a means to incorporate LPS. Most Contractors use minimum requirements outlined above because it is the least expensive and less labor intensive. What they do allow is the Solar Panel Frames can be treated like Air Strike Terminals which you eluded to Mike. You bond them together, and run a Lightning Down Conductor directly to the Ground Electrode System bonded at one point only. So if Lightning does strike, it stays outside where it belongs and goes around your home (shunted) harmlessly to DIRT. If the two systems were Isolated as Gendil suggest, you would be in deep chit again. You would have one Ground System at one potential, and the other Ground System at a different potential. That potential difference will be in the 10's of thousands of volts right across your Controller and would flash-over turning your controller into ash and anything around it like you. That is why NEC 250.50 and 250.58 are in the code. Anyway Mike hope you and all Calaphonies are safe with a roof over your head. Even Jefflorey or what's his name. Anyway here is a drawing of the two methods allowed by NEC and how to wire them properly. If Gendil had only looked at the Stickies would have found his answer already. Last edited by Sunking; 11-14-2018, 05:57 PM. Care to share what you are smoking? cold >>>>controller that what they are ...............use your intuition your are not an electronics reading machine to be stopped by a typo! controller chasis and all to rode and then deep to ground we will have system that willl absorb flashing lighting to ground GOOD BUT! Last edited by gendil; 11-15-2018, 04:16 AM.